Male / Female; Proven sales experience; Familiarity with different sales techniques; Strong communication, negotiation and interpersonal skills; Self-motivated and driven. Graduate of Bachelor’s/College Degree in Accountancy/ Internal Audit, Business Studies/Administration/Management and other related course; Being a CPA is an advantage; With 5 years’ experience in financial and operations auditing work; Must have strong knowledge of audit processes and internal controls; Must have an eye for detail and above-average analytical and problem solving abilities; Must have an excellent verbal and written communication skills; Must be able to work well with people at all levels of the organization. Male; At least high school graduate / Vocational / Automotive short-course graduate; Minimum of five(5) years’ experience specializing in trucks and/or equipment mechanical troubleshooting; Preferably with skills in driving vehicles; With good moral character, hardworking and can work beyond normal working hours. Male; At least high school graduate; With experience in canvassing and purchasing; Familiar with driving in Manila area; Must possess a valid Driver’s License and knows basic mechanical troubleshooting; Can work under pressure and beyond normal working hours. At least High school graduate / Vocational graduate; With minimum 2 years related experience; With experience in operating Crane, Bulldozer, Dump Truck, Loader, Grader, Compactor or equivalent; With TESDA Qualification on HEO NCII; With Driver’s License code 1,2,3 and 8; With good moral character, hardworking and can work beyond normal working hours. At least High school graduate / Vocational graduate; With professional Driver’s License and knowledge in basic mechanical troubleshooting; Minimum of 2 years of experience in related field; With good moral character; Willing to work beyond normal working hours. With Vocational / Short Course in Welding and/or related course; With related working experience in welding, fabrication/machine shop works; Must have knowledge and skills in driving vehicles, experience in driving trucks is an advantage; With good moral character; Hardworking and can work beyond normal working hours. At least High school graduate; With minimum of two(2) years experience in plumbing works; Must have knowledge and skills in driving vehicles, experience in driving trucks is an advantage; With good moral character; Willing to work beyond normal working hours. Preferably Mechanical or Industrial Engineering graduate; With at least 2 years related experience in a manufacturing company; Good in verbal and written communication of the English language; Fast learner and organized. HRM graduate is advantage; At least 5’4” in height with fair complexion and with pleasing personality; Knowledge of principles and processes for providing customer and personal services; Knowledge of principles and methods for showing, promoting, and selling products or services; Knowledge in getting food orders on order slips, memorizes orders; Can prepare hot, cold, and mixed drinks for patrons, and chill bottles of wine; Can explain how various menu items are prepared, describing ingredients and cooking methods; Can prepare tables for meals, including setting up items such as linens, silverware, and glassware; With good oral character; Can communicate well; With at least one(1) year related working experience; Can handle pressure. Female; With pleasing personality; At least College level; Preferably with background in cashiering and POS; Can work on flexible hours; Energetic and highly trainable; With good moral character; Can communicate well; With at least one(1) year related working experience; Can handle pressure. Male; Candidate must possess at least a Vocational Diploma / Short course Certificate in airconditioning troubleshooting and repair; Must know the principles of air-conditioning unit installation, repair and maintenance including controls, safety practices and procedures and tools used; Willing to work on extended hours and under shifting schedules; Energetic and highly trainable; Can communicate well; With at least one(1) year related working experience. Male; Preferably graduate; At least 1 year as stock custodian, inventory control preferable in a food industry company; Knowledgeable in Microsoft Office; Willing to work on extended hours and under shifting schedules; Energetic and highly trainable; Can communicate well. **SUNVERDE HOTELS and RESORTS, INC.
Can initiate sales process by prospecting, scheduling appointments, initial presentation, developing proposals and closing sales; assist Sales and Marketing Manager with account plans; Committed in a timely manner and resolving issues promptly; Can coordinates and manage clients’ events; Regularly update banquet brochure, flyers, and facts sheets; Good with meeting deadline reports Hotel manager; Coordinate well with other people; Possess a lot of patience and strong determination; Ability to adapt quickly; computer skills; Critical thinking skills; Time management skills; coordination and good communication skills; Service orientation skills. Preferably Female; Single; Candidate must be a Bachelor’s Degree; with at least 1 year experience in the same field; Keen observer; Can handle pressure. College graduate; With pleasing personality; With hotel experience as Front Office Assistant; Good communication skills. 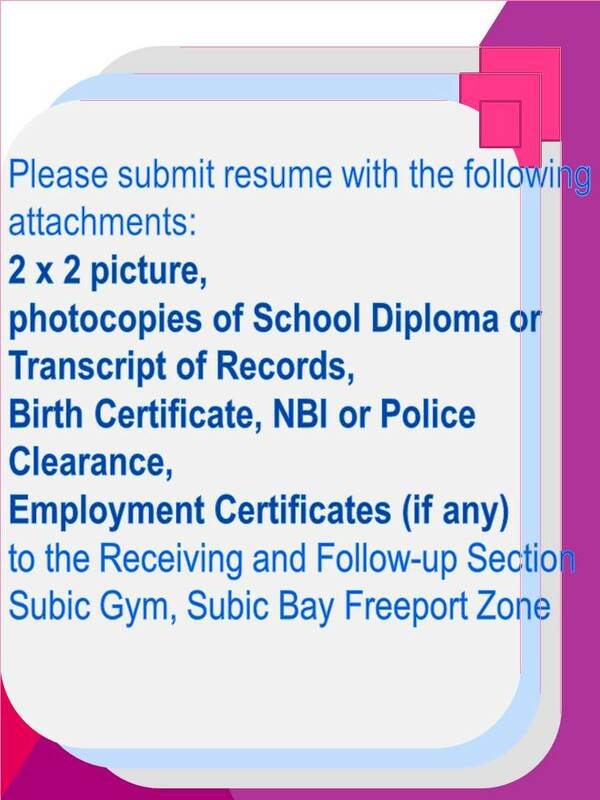 - ALL APPLICANTS ARE ADVISED TO SUBMIT THEIR BIO-DATA OR RESUME WITH THE FOLLOWING ATTACHMENTS: 2 X 2 PICTURE (RECENTLY TAKEN), PHOTO COPY OF BIRTH CERTIFICATE, SCHOOL DIPLOMA OR TRANSCRIPT OF RECORDS, PROOF(S) OF WORK EXPERIENCE(S) AND NBI / POLICE CLEARANCE AT THE RECEIVING SECTION OF THE MANPOWER SERVICES DIVISION- LABOR DEPARTMENT, SUBIC GYM. - LIKEWISE, ALL APPLICANTS FOR THE ABOVE POSITIONS ARE ADVISED TO CHECK AT SUBIC GYM BULLETIN BOARD, FOR THE SCHEDULED DATE AND TIME OF EXAMINATION / INTERVIEW. - MOREOVER, APPLICANTS ARE DISCOURAGED FROM APPLYING DIRECTLY TO LOCATORS / INVESTORS TO AVOID POSSIBLE EMPLOYMENT PROBLEMS IN THE FUTURE UNLESS OTHERWISE REQUESTED BY THE COMPANY FOR THEIR ASSESSMENT.